Newly built 2 bedroom, 1 bath Ohana in a peaceful neighborhood. The "Cozy Kamuela Cottage" is a newly built 2 bedroom, 1 bath home located in beautiful Waimea and nestled at the top of Hohola Drive in a peaceful neighborhood. Waimea, meaning "red water", is the home of the "Paniolo" (Hawaiian cowboy). There is a rich heritage of ranching and farming that has been passed down for generations. Take in the beautiful scenery of Parker Ranch's rolling green hills (once the largest ranch in the world), while dinning at one of the five star restaurants in the area, such as Merrimans. Visit our weekly farmers markets hosted by our friendly local farmers and craft makers. Also, adventuring out of Waimea is a must! The big island has so many spectacular attractions, from visiting Hawaii's active volcano, Kilauea, to swimming with manta rays at its beautiful beaches. You will fall in love with this special island! Hope to see you soon! Aloha! Our names are Jaiya and Tiffany, and we are the owners of this cozy cottage. We are husband and wife, and were born and raised here on the islands. We know all about what this beautiful island has to offer and we'd love to fill you in! 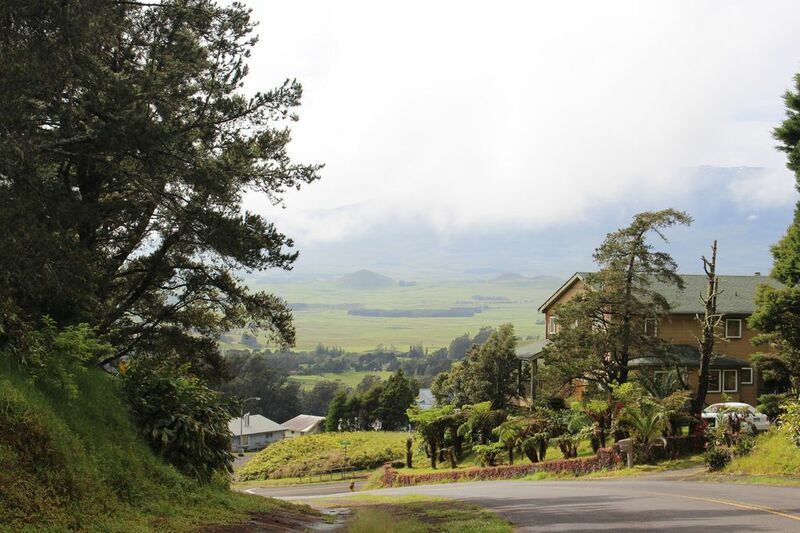 We invite you to enjoy our relaxing cottage located in beautiful Waimea, on the island of Hawaii. We have always loved Waimea's small town atmosphere and beautiful lush rolling hills, so when the opportunity came to own a property on Hohola Drive, we were blessed and fortunate enough to purchase the land to build this "Cozy Cottage". Waimea has everything you need minutes away - specially boutiques, farmers markets, five star restaurants, grocery stores, post office, banks, parks and more! There is even a local movie theater in the historic town of Honokaa less than 15min away. You'll enjoy the refreshing country setting up in the mountain with the perks of being only 20mins away from some of the world's most beautiful beaches. toilet, shower, Custom tiled shower with marble fish inlays. Beautiful Maunakea one of only two Mountains in Hawaii that gets a snow cap a few times a year. Beautiful open design kitchen, stainless steel appliances, island with seating for two. Jaiya & Tiffany accommodated us at the last minute and everything was perfect! Very clean with comfortable beds and all the amenities of home! Our family of 4 very much enjoyed our stay while we explored the North side of the island. The beds, sheets, and towels were very nice. The home was very clean and well thought out to include everything we needed for our 10 day stay. Home owner was very responsive and kind to answer any questions we had. Highly recommend this beautiful home! Thank you very much for your nice review! We’re so happy the cottage/location worked out. We hope you had a wonderful holiday season and we wish you all the best! Thank you for your nice review and for choosing to stay with us! We were so happy to welcome your family and hear that everything went well. Please feel free to contact us if you’re ever visiting again. Once again we had another great stay at this wonderful immaculately CLEAN home. Tiffany and Jaiya go overboard to make you feel at home and comfortable. We are looking forward to booking our next (3rd) stay at this cozy home. Our family has been in the process of moving to Waimea. We stayed in this adorable and very well thought out house. We used it as our “home base” while trying to get our home put together. We have a 2 year old, so the movies and portable crib were much appreciated. The owners have thought of everything you could possibly need. They had snacks and beverages for us and our little one in the kitchen when we arrived, which was so nice after a long flight! My wife works remotely in tech, so internet is imperative. She never had a issue with connection or signal. The house is adorably decorated and very comfortable. This is one of the most well thought out vacation rentals that I have visited. I have recommended it to our visiting friends and family. Thank you for you sweet words and wonderful feedback! It was a pleasure to have you and your family stay at our cottage while you were in transition to your new home. We hope all has been great at your new job. We wish you and your family all the best! The "Cozy Kamuela Cottage" is a newly built 2 bedroom, 1 bath home located in beautiful Waimea. Nestled at the top of Hohola Drive in a peaceful neighborhood. Waimea, meaning "red water", is the home of the "Paniolo" (Hawaiian cowboy). There is a rich heritage of ranching and farming that has been passed down for generations. Take in the beautiful scenery of Parker Ranch's rolling green hills (once the largest ranch in the world), while dinning at one of our five star restaurants, such as Merrimans. Visit our weekly farmers markets hosted by our friendly local farmers and craft makers. Adventuring out of Waimea is a must! The big island has so many spectacular attractions, from visiting the United States only active volcano, to swimming with manta rays at its beautiful beaches. You will fall in love with this beautiful island! Hope to see you soon!